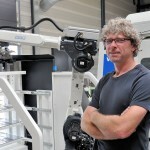 Merrem Kunststoffen of Dinxperlo has had two automated production cells in use over the last few years. The cells, however, are only fit for large series production. The decision was recently made to automate small series production, with a BMO Automation flexible production robot cell, consisting of a Finetech GTX-620 5-axis processing centre and a Platinum loading system. The same cell was also installed at Merrem Materialen in Zaltbommel, the parent company. And before being made operational, both cells were the star attraction of the Dormac CNC Solutions, BMO Automation and Siemens open days in Nederweert. It was there that Joop Leonhardt, the technical director and co-shareholder at Merrem Kunststoffen, explained that the two cells constituted an essential addition to the existing automated system, adding that the manufacturer was now able to efficiently produce smaller series of ca. fifty units. Leonhardt spent some time evaluating various combinations and in the end arrived at Dormac and BMO – two companies who frequently collaborate in the automation of machining processes. He feels that it was a logical decision, firstly because Merrem already has some twelve Dormac machines in use. Each one of the highly reliable; with the machine supplier from De Goorn ensuring quality customer service. “And actually, that’s all a machine needs”, says Leonhardt. “But in this case the robot and the machine controls were more important. They must be easily programmable, you see. Quick programming and easy adjustment give one the flexibility needed to make the production of small series financial feasible.” And easy programming and adjustment is exactly what BMO, the manufacturer and supplier of automation solution for loading CNC turning and milling lathes, focuses on providing its clients. Speaking on the subject, Frank Biermans, the director and founder of BMO, remarks: “We design our systems and our software in particular to ensure a very low threshold regarding switching products. Our cells are so easy to use that users can even still choose to load a final product right before closing time. Merrem’s new production cells consist of a PT20 robot cell from BMO’s Platinum series and Finetech GTX-620 5-axis processing centre. The Platinum robot cell allows for a combination of product and pallet loading or simply product loading for one or two CNC machines. The Merrem cells each have seven product trays of 20 kg capacity and a double gripper, which allows for loading and unloading the product by the robot in one swift motion. Trays can also be refilled during operation. The flexible layout of the loading system also allows for a variable product height. The Finetech GTX-620 5-axis, a mid-range segment machine, is a 5-axis simultaneous processing centre with a vertical pivot allowing for complete 5-axis functionality using an integrated turning table. A major advantage of the Finetech is the good accessibility of the milling compartment. The machine is fitted with a sizeable door on both its front and side and is ideal for automation. René van der Peet of Dormac feels the machine is a universal option for milling, automation, and high capacities. BMO Automation specialises in side loaders, but a new front loading system was presented at the open day. The Pt20F cell, linked to a Puma 2100 SY turning centre, features product handling trays and four pallet sites for pallets with automatic clamps, thereby allowing the robot to change the set-up independently. This particular cell was sold to Makomar CNC-Verspaning in Boxmeer. The cell was designed to facilitate complete accessibility of the machine for the operator. It can also be combined with a milling and turning lathe.